VENICE, La. 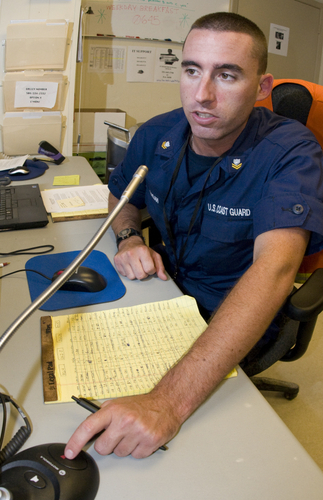 – Petty Officer 2nd Class Michael Eagan, Jr., an incident dispatcher for the Deepwater Horizon Response Plaquemines Branch, passes information to field personnel via radio in the communication center located at the forward operating base near Venice, La., Aug. 18, 2010. Eagan, a Wildwood, N.J., resident, is a member of the Coast Guard Reserve from Sector Baltimore who has been activated for the Deepwater Horizon Response. U.S. Coast Guard photo by Petty Officer 3rd Class Henry G. Dunphy.